I am starting a new feature on the blog called Labcoat Fridays, where I will talk about some exciting developments happening in various areas of science. It probably won't be a weekly feature, as these posts would require a lot of prep work, but we'll see what happens. Here is the first Labcoat Fridays post! As a materials scientist, I have a membership with the Materials Research Society, also known as MRS. As part of that membership, I receive a monthly publication called MRS Bulletin. The September issue was of particular interest to me, as it focused on sustainability and biopolymers, two topics that I am very excited about. Biopolymers are simply plastics that are derived from nature rather than fossil fuels (aka oil). On a very basic level, the concept of sustainability means living in a responsible manner. And as we are all aware, some of the current practices involving plastics can hardly be called sustainable. For example, those plastic bags that we get in the store every time we shop (and forget our tote bags) likely end up in the landfill, where they indefinitely remain as trash. In the worst case, the plastic bags wind up in the ocean, where they trap and suffocate many small animals. Sure, you can bring your plastic bags to a local store to be recycled (unfortunately, they are not accepted as part of household recycling), but how many people actually remember to do that? And that's just the plastic bags! I am lucky enough to live in a community where almost everything can be recycled or composted, but there are still many cities that have no household recycling programs at all, and those that do are very limited in the items they accept. Nevertheless, it's difficult to deny the advantages of using plastics. Plastic containers reduce food spoiling, plastic parts are vital to the health care industry (think of all those disposable syringes that prevent contamination and infection), and plastics are responsible for our cars being much lighter than those older metal models. Lighter cars use less fuel (something we can all be happy about with these gas prices). Of course, plastic cars also dent easier. Yes, plastics aren't perfect, but they are definitely useful. So, wouldn't it be great if scientists could come up with plastics that are naturally sourced (no dependence on oil) AND decompose when they are no longer useful? Well, that is exactly what has been happening in science, as I learned in an article by P.J. Halley and J.R. Dorgan. Several areas of science have come together to bring sustainable plastics into existence. 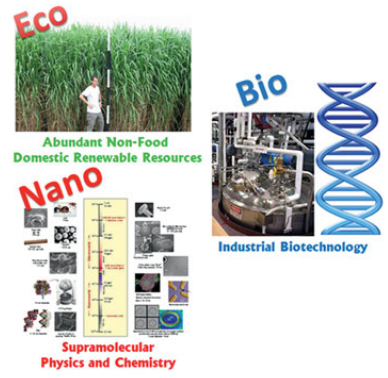 Ecology, biotechnology, nanotechnology - these sound like a bunch of buzz words that could be rearranged indefinitely to come up with a name of some biotech startup company in California. But it's exactly these buzz words that may be responsible for helping us use plastics in a sustainable manner in the future. These sustainable plastics, or biopolymers, have at least one thing in common - they are all derived from nature. Which just means that these plastics come from plants! That's where ecology comes in - growing plants as a naturally renewable resource for making plastics. 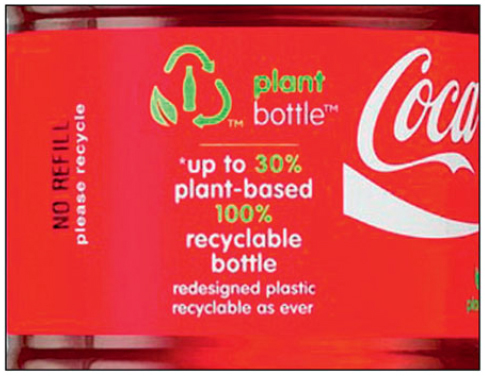 Of course, you can't just take a bunch of grass and make a Coke bottle out of it - there are some intermediate steps involved. Sometimes, these steps involve biological organisms, like bacteria or algae, which digest the plants to make the plastics. These steps are part of biotechnology. Some plastics that are commonly used in food packaging, like starch or cellulose (you know, the thin, crinkly plastic that crackers are often wrapped in), are made from plants in one step. All you do is feed some plants to algae, make sure those algae are happy little campers, and voila! - you have yourself a sustainable plastic. Well, that's all fine and good, but the reality is that sometimes those bio-plastics just don't perform as well as oil-based plastics. Maybe they are not strong enough, or maybe they decompose prematurely (imagine that: waking up on a Monday morning, getting ready for your commute, only to discover that the front bumper of your car is... gone). Whatever the issue, we have a ways to go before we can really replace all the current plastics with their bio versions. But nanotechnology has developed some ways to make these sustainable plastics be useful now. For example, if the biopolymer is not strong enough, its strength could be increased by adding strong natural fibers, such as hemp or jute, to the plastic. The final product is still all natural, but now also much more useful for things like interiors of automobiles (that way, your glovebox compartment won't spontaneously deteriorate overnight). All pictures from the MRS article linked to in the post. I finally had the time to read this piece. Thanks for sharing, it is very interesting. I am also quite amazed by the bacteria / algae capable of digesting oil, if they manage to develop those, they could basically clean the ocean. I hope the demand of this kind of product increases in such a way that we actually see the effect on our everyday lives. But we are getting there... I want to believe. I think the demand might be there in terms of people wanting this kind of product around, but the financial demand must also come from somewhere - research and development is so expensive and involves a lot of trial and error (and failure).